JNTUH B.Tech/B.Pharmacy R15 Regulations Academic Requirements, Promotion Policy. 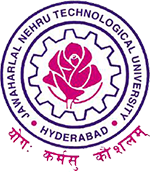 JNTU Hyderabad has announced B.Tech and B.Pharmacy R15 Regulation New Academic Requirements, Promotion policy (number of credits required) for JNTUH R15 regulation students. The candidate shall pursue a course of study not less than 4 academic years and not more than eight academic years. After eight academic years of course of study, the candidate is permitted to write the examinations for two more years. The candidate shall register for 226 (224+2 credits for Gender Sensitization) and secure 218 (216+2) credits and all practical subjects, Industry oriented mini project, Comprehensive Viva-Voce, Seminar and Project work are compulsory subjects. The student can avail exemption of two subjects upto 8 credits, that is, one open elective and one elective subject OR two elective subjects. A student is eligible to write the University examinations only if he/she acquires a minimum of 75% of attendance in aggregate of all the subjects. Shortage of Attendance below 65% in aggregate shall not be condoned. If any candidate fulfills the attendance requirement in the present semester or first year, he/she shall not be eligible for readmission into the same class. A student is deemed to have satisfied the minimum academic requirements if he/she has earned the credits allotted to each theory/practical design/drawing subject/project and secures not less than 35% of marks in the end semester exam, dnd minimum 40% of marks in the sum total of the mid-term drid end semester exams. From second to third year upto II year I sem : 50 credits out of 84 credits from one regular and one supplementary examinations of 1 year, and one regular and one supplementary examination of II year I semester irrespective of whether or not the candidate fakes the examination and secures prescribed minimum attendance in all II year II semester (60%). 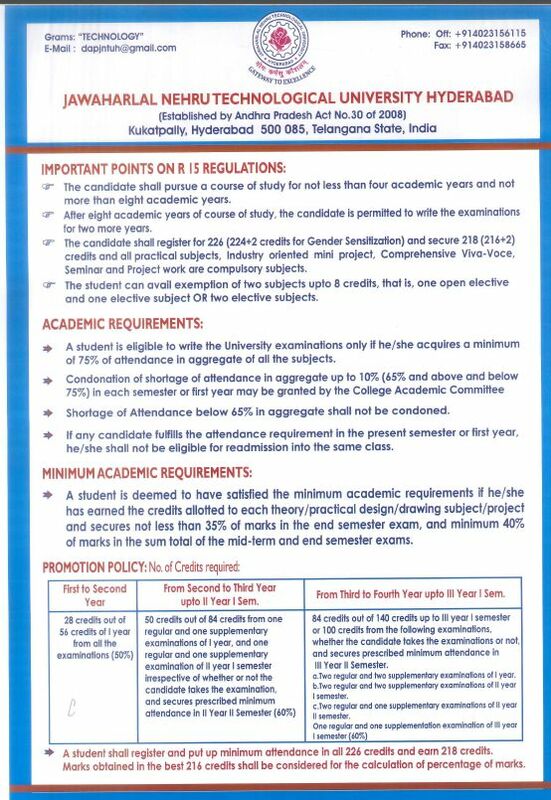 From third year to fourth year upto III year I sem : 84 credits out of 140 credits up to Ill year I semester or 100 credits from the following examinations, whether the candidate takes the examinations or not, and secures prescribed minimum attendance in all III year II semester. a. Two Regular and two supplementary examinations of I year. b. Two Regular and two supplementary examinations of II year I semester. c. Two Regular and one supplementary examinations of II year II semester. a. One Regular and one supplementary examination of III year I semester (60%). A student shall register and put up minimum attendance in all 226 credits and earn 218 credits. Marks obtained in the best 216 credits shall be considered for the calculation of percentage of marks. 1 JNTUH B.Tech/B.Pharmacy R15 Regulations Academic Requirements, Promotion Policy. I want 2 discontinue my btch due to financial prblm is it possible 2 take my certificates with out any charge…..
sir i am lateral entery student i got 16 credits out of 28 in till 2 1 and 2 2,i got 38 credits out 56…i am r 15 student.. as per rule jntuh 34 out 56 till 2 2 can i promote sir.. plz reaply me… i wainting sir..
sir i got 48 credits upto 2-1 and in 2-2 i got 70 credits can i promote to 3rd year??? I have 76 credit up to 2-2 sem..
Sir.i get 56 credit from 1 regular and two supplementary exam of 1st year .and 1 regular and one supplementary exam of 2nd year 1 St seem…can I promoted to 3rd year. Plz tell me sir….